Lawrence Judd was born in Honolulu, grandson to Gerrit P. Judd who had been sent to the Islands by the American Board of Missions and later served as advisor to Kamehameha III. Lawrence was educated at Punahou and Hotchkiss School in Connecticut and began his business career with Carnegie Steel and Whiting Paper Company before returning to Hawai`i. Back in the Islands, he worked for both Alexander & Baldwin and Theo Davies before serving in the First World War. 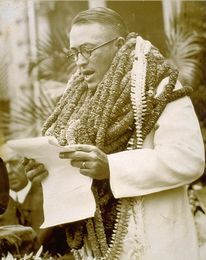 Judd's political activity included time in the Territorial Senate, membership on the Honolulu Board of Supervisors and leadership roles in the Republican Territorial Central Committee. Judd served as territorial governor from 1929 to 1934, appointed by President Hoover. While governor, he took particular interest in Kalaupapa on Moloka`i; he also worked to improve parks, playgrounds and the Natatorium war memorial. Judd was called out of retirement in 1953 when President Eisenhower appointed him governor of American Samoa. In later years, he served as a trustee of Lunalilo Estate.